This is one of my favorite sets, namely for this image. I love the intricacy of the design; it can be completely watercolored or you can do what I did, and highlight just a few elements of the illustration. I inked this image in Jet Black Staz-On ink because it is permanent ink and won't bleed when I apply color with the Blender Pen, Stampin' Write Marker or Aquapainter. I can be a little heavy-handed with those sometimes! 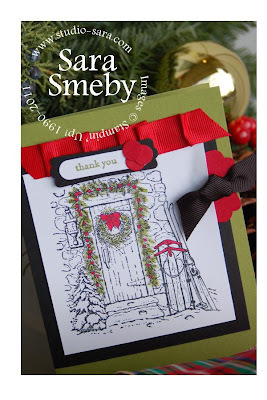 I opt for Staz-On over embossing for this particular image because the finer elements of this image can get lost in embossing (the wispiness of the garland, for example). So pretty Sara = love that little touch of color!